Four weeks ago, when we were on our honeymoon aboard our fancy Italian-style Meditteranean cruise, I thought about this post and how I would call it something like “Where we learn the real meaning of Christmas” and talk about how we spent Christmas aboard the ship and missed our families, but were happy to be with each other. Or I’d call it, “Sheesh, Italians,” after one yelled at me for bumping into him. Or maybe I’d call it “Constipation Nation” where I’d talk about procuring laxatives in a foreign country as a result of 9 days of cruiseship food. And then a couple Friday nights ago I saw a tweet from NPR that said that our ship had sunk. 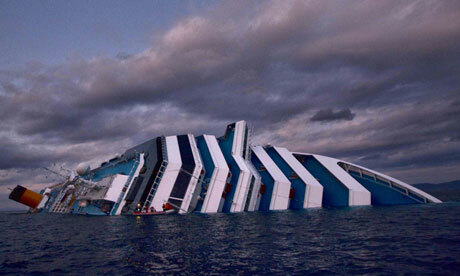 The Costa Concordia had run aground off Italy, and deaths were reported. Same ship. Same route. Same captain. Same crew. Costa Concordia, two weeks after we disembarked. So, there’s that. It’s impossible to tell any kind of story about our honeymoon without acknowledging that any mild complaints we had are now completely quelled by the fact that we didn’t have to fight anyone for a life boat, didn’t have to swim to shore, didn’t have to spend the night in an Italian town while our families in the US woke up to the news with no way to communicate with us, didn’t have to get on a 15 hour flight fresh off a shipwreck. 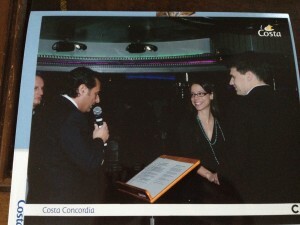 And our only interaction with the man at the center of the tragedy, Captain Francesco Schettino, was an amusing one where he gave us the opportunity to renew our vows a mere 6 days after uttering them for the first time. Charlie and I with the most hated man in Italy. Ooof.